George James McLoughlin was born in Scone, New South Wales, Australia. 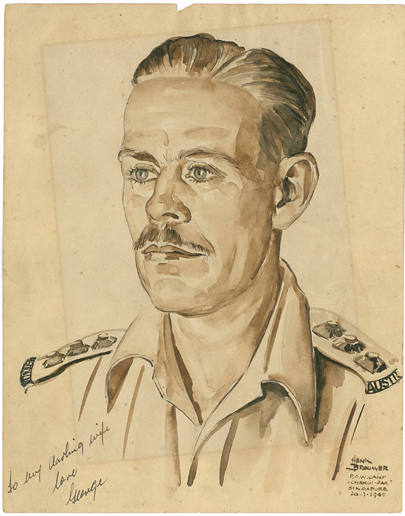 In February 1941, four days before the birth of his first child, he sailed to Malaya with the 2/18th Battalion, 22nd Brigade, 8th Division, AIF. He was promoted to Captain in August 1941. After the Fall of Singapore, he was taken to Changi as a prisoner of war. George volunteered to take out a work party and was sent to Tanglin Barracks, outside the city of Singapore. In January 1943, the men were sent back to Selarang Barracks in Changi. There he and his men were subjected to forced labour. They worked in the Ground Levelling Party, as the Japanese called the construction of Changi Aerodrome, and from 1 April 1945 on the Japanese forced the men to build tunnels in the hills in the centre of Singapore Island (Bukit Panjang), in order to prepare for the expected landing of the Allied troops. After the war came to an end on 15 August 1945, it took several weeks before George had to opportunity to go home. On 20 September he left Singapore by boat and arrived in Sydney on 5 October. He took with him the portrait that fellow inmate Henk Brouwer had made of him in Changi. George went back to his family’s sheep and cattle property near Scone, where he worked an lived the rest of his life. Three more children were born there. George always retained a close bond with his mates from the 2/18th Battalion, but they hardly spoke of their war experiences. Only some humorous stories were told. George died in 1995 at the age of 82.